NOTE: the reason that the onion, garlic and chilli are optional is for those of you planning on sharing your meal with your children, these ingredients are not essential and I know that they may deter the fussy eaters. Some people also may find they react to garlic and onion, I am personally trying to eliminate it from my diet due to bloating. Step 3. In a large fry pan on medium heat- add a dash of oil. Then add onion and garlic (if using) and sautee for a few minutes , stirring occasionally. Then add the chickpeas and parsley, salt, mixed herbs and continue to sautee for a few minutes more. Then add the tomatoes and the tuna, szeeze the juice from the lemon over in and stir through before removing from heat and placing in a large mixing bowl to the side. Step 4. 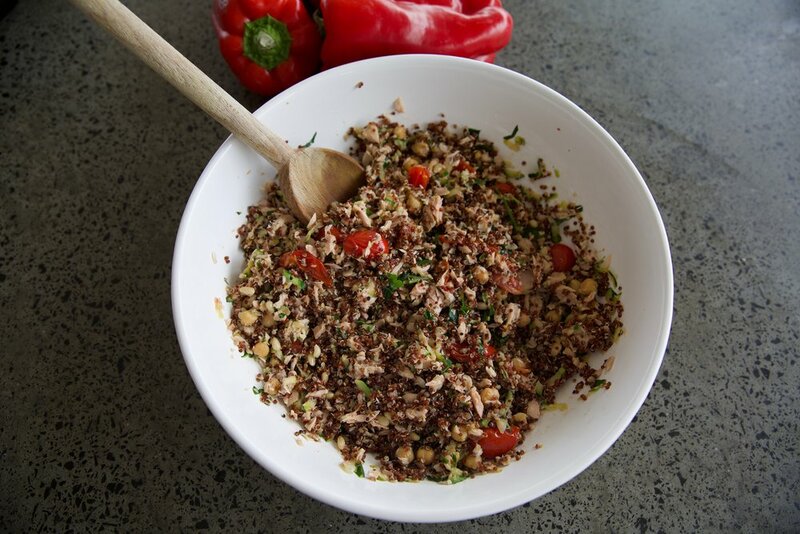 Once your quinoa is cooked add to the bowl with the other ingredients. Step 5. Cut the capsicums length-ways and remove seeds. Step 7. Space the capsicums out on a baking tray lined with baking paper, then spoon the mixture into the capsicums. Add the cheese to the top of each of them and then garnish with the left over parsley. Allow to cool slightly before serving. I like to serve with a salad or greens! Side Note: My son will not eat the capsicum (fussy eater) so instead I just give him the mixture in a bowl on its own. The tuna is already cooked and does not require to be placed in the oven before serving.